ˀKWAH (Quâs), Carrier chief; b. c. 1755 on what is now Stuart Lake, B.C., son of Tsalekulhyé and a woman from Nat-len (Fraser Lake); d. 1840 at Fort St James, New Caledonia. Legend has it that ˀKwah and his brother Œhulhtzœn (Hoolson) gained fame by avenging the murder of their father, who was killed by another Carrier group about 1780. The story is likely well founded, for inter-village conflicts among the Carriers, especially over women and gambling matters, were common. At some point ˀKwah became a nobleman. Since the tribe practised matrilineal succession, it would have been from a deceased male relative on his mother’s side, likely his uncle, that he gained this status. Upper Carrier villages ranged from about 40 to 120 persons and each had a chief and one or two nobles. By 1806, when the North West Company built Fort St James on the east end of Stuart Lake, ˀKwah was living near by with his four wives and was considered by the Carriers to be the village chief. In accordance with custom, he maintained his status by periodically giving inter-village feasts. One of his official responsibilities was to act as arbitrator in feuds between villages. The earliest firsthand account of ˀKwah, given by NWC trader Daniel Williams Harmon, dates from 1811. In a business dispute with the trader, ˀKwah asserted that the only difference between them was that Harmon could read and write. “You send a great way off for goods, and you are rich and want for nothing,” the chief remarked. “But do not I manage my affairs as well as you do yours? When did you ever hear that Quâs was in danger of starving? . . . I never want for any thing, and my family is always well clothed.” As their confrontation grew more heated, Harmon became convinced that ˀKwah was trying to intimidate him, and he beat the chief with a measuring-stick. A short time later ˀKwah feasted Harmon and apologized for his behaviour, but this was not the last time that he tested the traders. Although ˀKwah often angered them, and they him, he worked hard to ensure that both they and his own family were well provided with food, especially salmon from the weir which he toiled to keep in repair. ˀKwah “is the only Indian who can and Will give fish, and on whom we Must depend in a great Measure,” wrote trader James McDougall. Being a noble, ˀKwah inherited the right to certain beaver lands. Assisted by his sons and sons-in-law he was, like his fellow nobles, a chief supplier of beaver and other furs to Fort St James. Perhaps best remembered by whites was ˀKwah’s role in saving the life of James Douglas*, at the time a Hudson’s Bay Company employee in charge at the post. The incident stemmed from the murder by two Carriers in 1823 of two HBC employees belonging to Fort George (Prince George) over a sexual liaison. The traders requested that the Indians kill the two murderers, and ˀKwah was suspected of dissuading them from doing so. Several years later one of the culprits visited ˀKwah’s village. He hid in ˀKwah’s house, the chief being away, but was killed by Douglas and other HCB men when discovered. After ˀKwah returned, he and the other villagers stormed the post demanding an explanation. While ˀKwah’s nephew held a sword at Douglas’s breast, the chief requested that no blood be shed. Gifts were thrown by the women of the post, and the Indians went home, compensation for the death having been received. Despite the mob frenzy, ˀKwah had maintained his composure, probably realizing that to harm the traders would eventually bring retribution. ˀKwah died during the summer of 1840 and that November a funeral feast was held in his honour. Unlike his ancestors, he was buried instead of being cremated. At his death he was perhaps the most important Indian in New Caledonia, from both the traders’ and the Carriers’ perspective. The whites had dubbed him king of the Carriers. His third son, who succeeded ˀKwah’s brother as chief despite the matrilineal tradition, became known as the Prince. ˀKwah left 16 children and numerous grandchildren. When missionaries began baptizing Indians in the area during the middle of the 19th century, the family was given the surname Prince. PAM, HBCA, B.119/a/1; B.188/a/1–19; B.188/b/1–6; B.188/e/1–5 (mfm. at PAC). D. W. Harmon, Sixteen years in the Indian country: the journal of Daniel Williams Harmon, 1800–1816, ed. W. K. Lamb (Toronto, 1957). C. A. Bishop, “Kwah: a Carrier chief,” Old trails and new directions: papers of the third North American Fur Trade Conference, ed. C. M. Judd and A. J. Ray (Toronto, 1980), 191–204. A. -G. Morice, The history of the northern interior of British Columbia, formerly New Caledonia, 1600 to 1880 (Toronto, 1904). W. P. Johnston, “Chief Kwah’s revenge,” Beaver, outfit 274 (September 1943): 22–23. 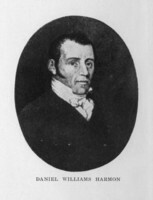 Charles A. Bishop, “ˀKWAH,” in Dictionary of Canadian Biography, vol. 7, University of Toronto/Université Laval, 2003–, accessed April 25, 2019, http://www.biographi.ca/en/bio/kwah_7E.html.